Five years ago, the future of Washington’s premiere crag was in doubt. Long owned by a private citizen, the heart of Index’s Lower Town Wall was closed for climbing. Index’s world-famous climbing routes draw users from across Washington, as well as globe-trotting athletes eager to test themselves against the notorious sandbags. But in September of 2009, no-trespassing signs popped up around the cliff during the prime autumn climbing season, and rumors swirled of a potential sale and quarrying operation that would destroy the recreation hub. The outcry and organizational efforts among private citizens, outdoor clubs like the Mountaineers and Boeing Alpine Club, and northwest companies was immediate, and ultimately effective at saving the wall. Now climbers are ready to celebrate what they’ve preserved. 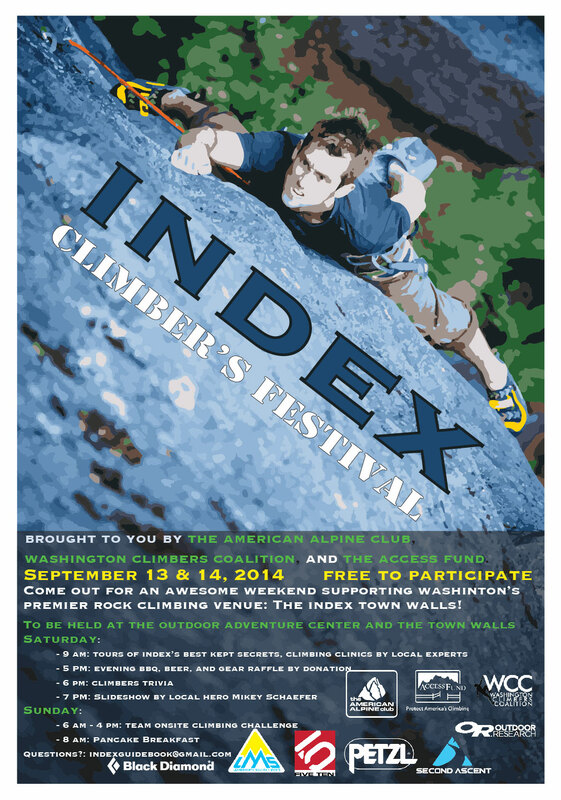 The first ever Index Climber’s Festival will be held Saturday and Sunday September 13 and 14th, with free events occurring in the Outdoor Adventure Center building as well as at the base of the climbing wall. Beginning at 9am Saturday, functions will include guided walking tours of the area’s less-popular climbing walls led by locals, an outdoor-themed trivia night on Saturday, and an all-day climbing competition open to climbers of all abilities on Sunday. Gear companies and retailers such as Petzl, OR, and Black Diamond have donated prizes for both of these friendly competitions. The event is hosted by the American Alpine Club, which sponsors similar classes, events, and festivals at climbing areas around the nation. Further support has been generated by the Access Fund and Washington Climbers Coalition. All three of these organizations worked together in 2009 to save the wall from destructive quarrying, or closure to climbing. Money was raised at slide shows, and donated from corporations. This month’s event also owes its inception to the time and efforts of a group of dedicated area climbers who have witnessed Index’s struggling economy firsthand, and have begun work on a new area climbing guide and access improvements to trails and climbing routes. Their popular facebook group, “Climb Index!”, has nearly 700 members. The land containing the Lower Town Wall was purchased by the nonprofit Washington Climbers Coalition in 2009, with funds loaned by the Access Fund and over $250,000 raised by private climbers. The climbing wall property is still owned by the WCC, but plans exist for an eventual transfer to Washington State Parks, with a contractual provision which would codify the rights of climbers to maintain access to the area’s famously high-quality routes. The Washington Climbers Coalition is still working to pay off this loan, and donations can be made at www.WashingtonClimbers.Org. Correction to the post above: Washington Climbers Coalition paid off the $15,000 loan from the Access Fund in 2010. The loan was the first project of the Access Fund Land Conservation Campaign and was used to secure the Option Payment and kick off fundraising.